Email communications were very helpful and informative. Answered many questions I may have had. Women on the phone were very helpful and made sure we had everything we needed. The one time I called with a question, the staff was very friendly and nice. We really enjoyed our trip. The cabin and view were fantastic. I highly recommend this rental company and their property. No problems at all. Everyone I met was very friendly and helpful. This was our fifth time with GSCR. No need to switch or even look at other rentals. Making reservations was easy and very professional. Your team was very helpful and responsive in all aspects of our interactions. Always a pleasure to work with your staff. Excellent service! Beautiful cabin, great view! The two comfortable chairs in front of the huge windows were greatly enjoyed...the view is great from many areas, from the kitchen sink to the Master Bedroom. Loved the screened porch and the covered porch. Also enjoyed hiking the mountain roads through the neighborhood...gorgeous, peaceful area. This was a wonderful Fall Vacation. We look forward to returning! Very pleased with the cabins and the people . Used Great Smokys for years...would not want to rent from any other company. Our stay was wonderful. This cabin was great. GSCR was very nice to work with and very helpful. We will stay here again and will recommend to all of our friends. Very Nice place! Really enjoyed our stay. Could not have asked for anything else, very relaxing. Thanks so much for a wonderful Cabin. We will try and return soon. Highly recommend the Brio Tuscan Grill - Awesome food. I may have talked to everyone there at one point or another and everyone was so helpful with everything! It was nice to speak to someone besides viewing the internet and we had a conference call with my sister trying to satisfy several families. They were so hleoful and accomadating us for the perfect place and dates we needed. There was follow up with us before the trip and after. This kind of service and attention was very much appreciated! We had a great time at Bear's Den! Everything we could have possibly wanted was here. Our only problem was the weather did not co-operate with us. Wish we would have had some more sunshine. Hope to come back again some day. 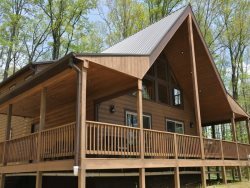 This is our 2nd stay in this cabin and again we felt like we were in heaven! Last time we were here in the summer. This time we got to enjoy the brilliant colors of the Autumn. Something we don't see so much in Texas. Thanks so much! I personally worked with Cathy. She was absolutely wonderful to work with. She absolutely went above and beyond to make sure that my reservations/check in was seamless.